Did you miss me? Having completed my year without beer, I have been away for a couple of weeks on a family holiday in the US, but that hasn’t stopped me making some progress on my 2013 challenge – to complete 2013 self powered miles in 2013! 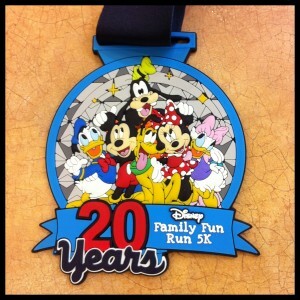 Whilst on holiday, my family and I took part in the Disney 5k Family Fun Run, part of the official Disney Marathon weekend. I had planned to do either the half or even full marathon, but sadly the event was sold out before I’d been able to confirm travel arrangements, luckily the 5k still had space. The event was really well organised and consisted of a run through the Epcot theme park. It started at 6:30 am, so there were no tourists to bump into (except slower runners), but there were still plenty of Disney characters around the route to high five or have photos with.